High Tech Connections offers an impressive line of factory-tough power and electronic retractile cords meeting a wide variety of user applications. Cords made from all weather SEO, SJTO and STO variants are light weight and exhibit excellent abrasion, oil and chemical resistance. Popular electronic retractile cords can be specified in shielded and unshielded constructions. They use extra-flexible soft copper conductors ensuring maximum retractile memory. Customers can specify insulation and jacketing materials from among popular PE, PU and PVC material. Thermoplastic Elastomer (TPE) compound is also offered. Cords can be supplied in many retracted lengths and with optional tangent end prep levels. 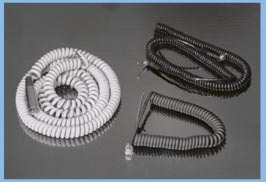 In addition to those cords shown here, High Tech Connections can also supply UL-listed coiled power cords with a molded NEMA 5-15P plug on one end. Retractile cords from High Tech Connections offer unmatched levels of quality, performance and reliability.